It has been a week of heavy hearts. Monday morning most of the world awakened to the news that a gunman on Sunday had trained automatic gunfire on a Las Vegas concert audience of thousands, killing 58 people and wounding more than 500 others. The horrific incident – following closely on the catastrophic damage caused in Puerto Rico by Hurricane Maria – reverberated loudly in Connecticut, a state with a close emotional connection to both events. It didn’t take long for the leaders of a state where 20 Newtown school children were slain to step forward offering condolances to Las Vegas and to condemn as “cowards” lawmakers who would not enact stricter controls over guns. 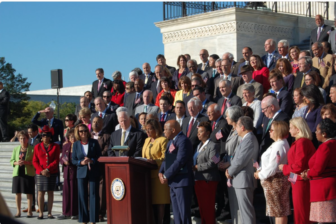 Members of Congress calling for restrictions on firearms. Connecticut Sens. Richard Blumenthal and Chris Murphy – 5th District congressman at the time of the Sandy Hook Elementary School massacre – once again led the push for gun control legislation, saying they plan to introduce bills requiring broader FBI background checks for gun purchasers and banning high-capacity ammunition magazines. U.S. Rep. Jim Himes, D-4th District, also wrote an angry op-ed in the Washington Post criticizing Congress’s “meaningless moments of silence designed to look compassionate and hide our inaction.” The others in the congressional delegation – U.S. Reps. John Larson, Joe Courtney, Rosa DeLauro and Elizabeth Esty, all Democrats – joined others on the steps of the U.S. Capitol to call for tighter gun controls and were chastised by Republicans for “politicizing” the massacre. The outrage and sorrow over the senseless killing in Las Vegas only amplified the misery being felt around Connecticut over the scale and scope of the rising death toll and continuing calamity in Puerto Rico. Friday, Blumenthal asked for a greater response to the crisis by the Trump administration and said he would be part of a bipartisan congressional group visiting the island to assess the situation for themselves. In recognition that many Puerto Rican students may be coming to Connecticut to escape the island territory’s devastation, the Connecticut State Colleges and Universities system planned to consider giving them in-state tuition rates. Of course, like a wet and cold blanket, the state’s struggle to adopt a budget continued to weigh on every aspect of governmental activity. Connecticut’s municipalities were surely in for a good dose of budgetary pain as Gov. Dannel Malloy withheld or reduced critical education and government grants due for distribution. And while Democratic and Republican lawmakers remain “hundreds of millions of dollars” apart in their effort to balance the books, thousands of potential new jobs are being put at risk, Malloy said. A crumbling foundation in Tolland. There are some other facts to be faced, meanwhile, like the President Donald Trump’s decision to roll back an Obama-era requirement mandating that businesses include birth control benefits in health care policies covering their workers. 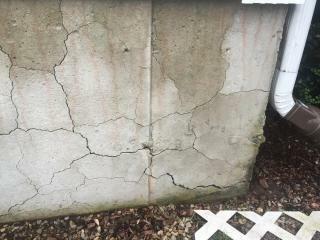 The other fact is that federal authorities have declined to classify the crumbling concrete foundations around Northeast Connecticut — damage caused by pyrrhotite, a mineral that corrodes when exposed to water — as an emergency or major disaster eligible for federal assistance. Government soldiers on, however. Gov. Dannel P. Malloy made two nominations to the State Supreme Court: Appellate Judges Raheem L. Mullins and Maria Araujo Kahn. And even bitter adversaries, when confronted with new political realities, found a way to get along.